Jill Of All Trades: GOOGLE HANGOUTS WITH SANTA ONLY AT HAMLEYS! Don’t miss the chance to give Santa your Christmas list personally! As a part of ‘Christmas with Hamleys’, kids will get a unique opportunity to interact with Santa Claus before he leaves for the North Pole this Christmas! Thanks to technology Santa is now reachable to all kids via the Google hangout facilitated by Hamleys at our stores. To participate just visit any of the Hamleys stores across Mumbai, Delhi, Bangalore, Chennai and Kolkata between 5:00pm to 8:00pm on December 19th and get a chance to share your Christmas wish list with Santa personally! Visit Hamleys and join us as we spread the Christmas cheer with interactive and super fun activities, installations and much more which are a part of ‘Christmas with Hamleys’. India, December, 17th, 2015 – Christmas is around the corner and we at Hamleys believe in delivering a traditional Christmas that you would expect from The Finest Toy Shop in the World! The Hamleys experience is about its unique brand of theatre and entertainment which transports families to a world of fun and discovery. 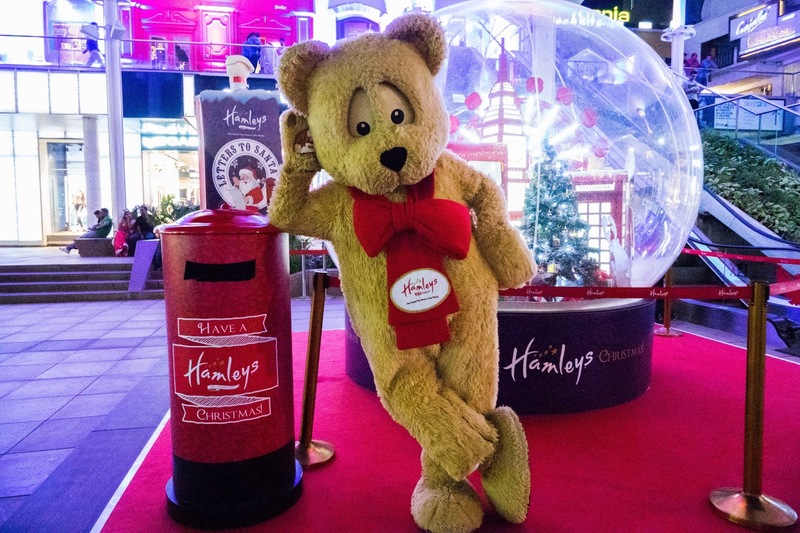 As a part of ‘Christmas at Hamleys’, there will be week-long festivities of fun, interactive activities held at the Hamleys stores, including, Santa visits, workshops, games, signature Hamleys Christmas parade, gorgeous interactive installations and much more. Hamleys will also give each kid an opportunity to get a personal visit from Santa himself with Hamleys ‘Letters to Santa’!, an annual property which kids and parents eagerly await every year. For parents it’s the joy of bringing back the lost art of letter writing as the kids write to santa about all the good deeds they’ve done during the year and the toy they desire. For kids its pure joy as they get a chance to experience a personal visit from Santa to their house with gifts of their choice, which is sure to delight any child! What’s more, this year Hamleys makes it even more easier for the kids to send across their letter to Santa, as he has become technologically savvy and children can reach him by either email, whatsapp and even his own website! To participate, all the child has to do is write a letter to Santa, tell him how you have been good this year and what toys you would like from him (you can even choose from the Hamleys India Christmas top 10 toy list), and you may just get a surprise visit from Santa himself! The best letters will get a visit from Santa to your house, with your wish list of toys delivered to your doorstep and also get to attend a Hamleys exclusive Christmas party. Hamleys has always been more than just a toy store. It is about bringing toys to life with exciting events, all of which come together to provide a magical experience where creativity and imagination run free. One can visit the Hamleys store for a host of interesting Christmas activities leading to the grand Christmas parade at the end. Christmas with Hamleys’, kids will get a unique opportunity to interact with Santa Claus before he leaves for the North Pole this Christmas! Thanks to technology Santa is now reachable to all kids via the Google hangout facilitated by Hamleys at our stores. Decorations, Snowman and much more! Hamleys, The Finest Toy Shop in the World from the UK is also In India. With the opening of its first store in Mumbai at High Street Phoenix, Hamleys now present in 7 cities in India with 12 stores that capture the imagination of children with its wide range of toys, exclusive merchandise and magical experience. The Hamleys experience is an ultimate treat for the entire family. It offers a wide range of toys from much loved brands to more traditional toys and toys which have enthralled children over generations, as well as quirky and unusual treasures. This includes the Hamleys Own Brand range, renowned for exceptional quality and play value. The Hamleys experience is also not complete without its unique brand of theatre and entertainment which enthrals both children and adults alike. Toy demonstrators and magicians, unique demos and iconic fixtures, exciting events and activities all come together to provide a magical experience. vastu tips for south facing home entrance advises that any property with entrance facing towards the south western direction must be completely avoided as this is the direction of devil energy, which brings misfortune. In a country like India, vastu websites is considered one of the basic requirements while constructing a property or building according to pre-specified principles. It is necessary to follow these principles for wealth, health, fame and prosperity in life. Though it has become difficult to follow each and every principle in the present era, it is important to make maximum use of tenets in order to achieve peace and harmony in life.